There are a few minds I'd love to explore, just to learn what makes them tick. Stephen King is one. Seriously, what must his dreams be like? CS Lewis is another. Then there's Stephen Spielburg, director of fantastically weird movies like Jurassic Park. Can you imagine the creativity that would flow if you put those guys together? Science fiction, in my opinion, takes an extra dose of right-brain thinking. Although I've never given any science fiction writers the brain test to confirm my theory, J.D. Warren, author of Shadow Warrior, seems to support it. She's an avid reader and loves out-of-the-box thinking and problem solving, which is probably why she loves writing Sci-Fi. She says it lets the mind explore beyond the boundaries of reality of here and now to what might be. She loves to cook and says there’s nothing like the smell of homemade bread hot from the oven to warm the whole house like a hug. She also likes gardening, scrapbooking, and arts and crafts. Yep, she's a country girl. Her creative genes have certainly served her well. Her inspirational romantic suspense entries finaled in 2011 in the ACFW Genesis, and 2009 won ACFW Genesis in Romantic Suspense, and also in 2009 she won first and second place in Where the Magic Begins with a Romantic Suspense and Historical. J.D., according to Jeff Gerke, publisher at Marcher Lord Press, many who read speculative fiction aren't aware they enjoy this genre. For these readers, can you define speculative fiction for us? For me, writing speculative fiction is the unlikely or impossible made believable. It stretches me beyond the realistic boundaries defined by science, history, and the sole existence of man on planet earth. Stirring the imagination outside those boundaries, I often wonder, what if? To me, it’s the “what if” that defines speculative whether on earth or far reaches of the galaxies. We all love to dabble in those what-if questions now and then, don't we? What is the best speculative fiction novel you've ever read? That's a hard question. I enjoy sci-fi, fantasy and speculative. A few of my favorites are Unspoken by Angela Hunt, Terri Blackstock's Last Light series, Donita K. Paul's Dragon Keeper's series, The Oath by Frank Perretti my list is as varied as it is lengthy. Frank Peretti is the king of science fiction! My daughter read his YA Hangman's Curse and said it was the best Christian fiction she'd ever read. Although I think it might have been more of a suspense. Tell us about your novel's setting. The novel opens on Tyro’s, a once lush and productive farming planet known as the bread basket of that sector. Its inhabitants (think Amish or Mennonite simplicity) were hardworking souls that welcomed like-minded strangers. A smooth-talking scientist’s offer to help, they agreed to test the man-engineered creature designed to eradicate one specific noxious weed then die, further enriching the soil. The galaxy needs more food and they were willing to help, not for the money as much as for humanitarian purposes. That's awesome! What aspects will we relate to? We should all suspect anything that promises to be too good to be true no matter how convincing the person is doing the selling. In this case the Tyro’s Farmer’s League trust in a man claiming to have advanced science through DNA manipulation proved fatal to an entire planet. Was it a scam, an insidious plan of revenge, or an honest mistake? It doesn’t matter, the result was the same. An entire planet died a horrendous death, leaving questions in many minds. Had any escaped? Quarantined as a plague planet, no one was allowed to investigate for risk of spreading the contamination. How would you like not knowing if your loved ones were dead or held up somewhere waiting for rescue? What would you risk to find out the truth? That sounds like a suspenseful novel! I can't wait to see it in print! Thanks for chatting with me today. It sounds as if your novel hits on a theme mankind's been struggling with since the time of Shakespeare, and probably long before--civilization versus nature. We love technology, but often fear it at the same time. You're turn. What would it taste like? Smell like? How would you prepare it? Wow, I must be hungry. And if your stomach isn't dictating your thoughts at the moment, venture out of the kitchen. What's one appliance or tool you'd create? Join our cyber chat via the comments below, and who knows, you might even win a free book! 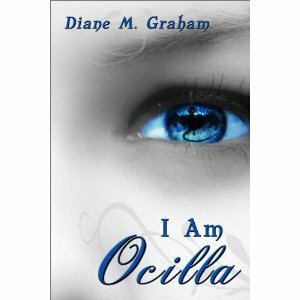 Remember, we're giving away Diana M. Graham's I am Ocilla! To enter our drawing, leave a comment, FB share this post, or tweet it. Open your heart and mind to the simplicity and complexity of a name. I know only my name. Beyond that is confusion, a void where fantasy and reality swirl together. Fairies, Giants, Elves, Dwarves, ancient Keepers, and...Dragons? A dark soul threatens the Five Kingdoms, but I am powerless to stand against him, overwhelmed by phantom memories, broken and lost. Somehow, I must live. I must find my purpose. There are friends to love and battles to fight. I know my name. Perhaps that is enough. Come back Wednesday to meet J.D. 's competitor, Chawna Schroeder! Fun post, ladies!Thanks for being with us J.D.! J.D., I really enjoyed your excerpt and getting to know you better! Winner of Flash Clash, First Hundred! Free Sci-Fi Novel! Thanks to Splashdown Books. Quarterly Christian Author's Guild Podcast!